Monster truck aficionados rejoice!! It’s that time of year that we've all been waiting for as the amazing Monster Jam live show hits the Frank Erwin Center on the Sunday 22nd April 2018! Get your tickets in advance for this hugely anticipated event to be sure of the best seats, and prepare for a really wild ride!! The Monster Jam has gained a reputation as the best monster truck competition in the world, and it’s easy to see why. The drivers at the show are specially scouted from the world’s top talent, and trained for the shows at the “Monster Jam University” in Illinois. Here, they learn safety, public relations and hone their driving skills under guidance from experienced Monster Jam drivers, ready to pull of death-defying stunts to delight audiences on the day!! What are you waiting for?? 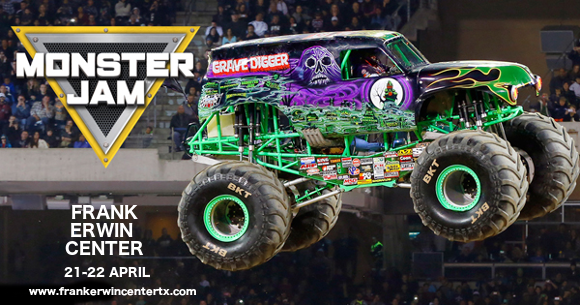 Grab your Monster Jam tickets now – you don’t want to miss it! !